1. 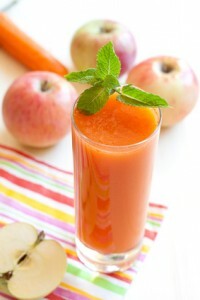 Chop the apples, cabbage and carrots into suitably sized pieces and juice them all alternately. 2. Serve the juice in a stylish glass. Preparation tips for the recipe with Green Star Elite: Save some of the carrots for juicing last, so that the other ingredients can be processed by the machine more easily.